You have to make do with what you've got, which in my case was a notebook and a marker. 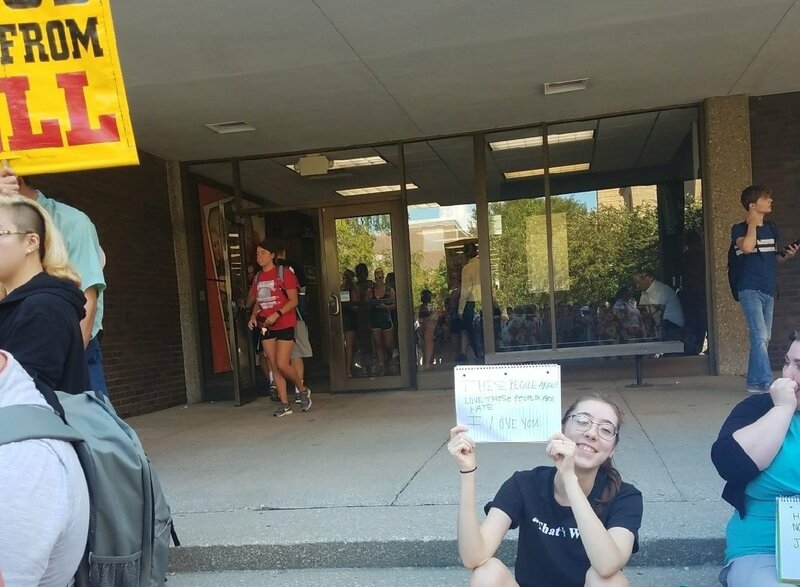 Last week I shared the story of my experience protesting on campus last year. I shared it in order to give some context for the story I am sharing this week. I realize now that what I thought was protesting last year wasn't even close to the real thing. September 5th, I was walking from the library back to my dorm room. I didn't have any classes that day and I was looking forward to getting lunch and going home to catch up on homework. I looked up from my phone as I was walking and noticed those same signs from last year demanding that women be submissive to men and nonsense about being gay is a sin. Then I saw the crowd of students and the middle-aged white men littering the steps of our Education building. One had a megaphone and was shouting about how we were all going to hell, amongst a lot of other foolishness. I stood with the crowd of my peers and listened for a moment. I saw my classmates and peers visibly upset about the men that were harassing them on their own campus once again. I stood there for a while and just watched as other people bravely stepped forward and voiced their anger with the hatred this group had brought here, under the guise of Christianity. I felt myself getting more frustrated and I had already yelled out a couple things by that point. What I did next is not revolutionary or game-changing by any means, but for someone who doesn't like to draw attention to herself, it was significant. Borders had been formed; the bigots on the building steps and the students a couple of feet away on the sidewalk. I sat on the steps. I pulled out my notebook and a marker from by backpack, wrote "These people [the faux-Christian bigots] are not love. These people are hate. I love you." I flipped it around and help it up and immediately felt everyone's eyes shift to me. For a minute, I felt like I had done the wrong thing. It was corny, wasn't it? What difference was this really going to make here? Then people started coming up to me, one by one and asking if they could join me on the steps. They took out their own notebooks and we passed my marker down the line. At least five other people sat with me there with their own signs for at least an hour. In that time, I had people come up to me and take pictures of me, say thank you, give me a meaningful smile, a thumbs up, etc. There was even a wonderful person who brought me a bottle of water since it was about 90 degrees out. I didn't think my little sign would do anything but my silent little protest made a lot of people feel more comfortable. But then my protest wasn't so nice and quiet. One of the bigots moved his homophobic sign in front of me to block people from reading our signs. Angry about the fact that he felt he could do that on our campus, I got up and stood in front of his sign, telling him that he's not going to get to do that or advertise nonsense. He started trying to move his sign around me but I continued to move in front of it, holding my sign up the whole time. A few people even joined me. Eventually, he grew tired of us and put the sign away for a while. I ended up staying out there for a total of four hours that day, my sign in hand. I stayed on the steps well after the bigots left campus, talking to the people who had joined me and discussing ways to be better activists the next time these people showed up on campus, while additionally talking about how we could take this energy and be better for the people of color on campus. I learned a lot - about myself, about activism, about what solidarity really means. I want to acknowledge the people who joined me and gave me water and supported me in any way. It was a small act on my part, but the kindness I experienced that day was immense. My only goal was to make my peers feel more comfortable on their campus amidst the chaos. And while I didn't change those bigots' minds, I made people smile... and I'll be more prepared next time they come around.